Yamaha have just announced a big update to their range of beginner’s electronic drum kits. The brand new Yamaha DTX402 series is designed to help new drummers improve their skills and technique, with some great features. 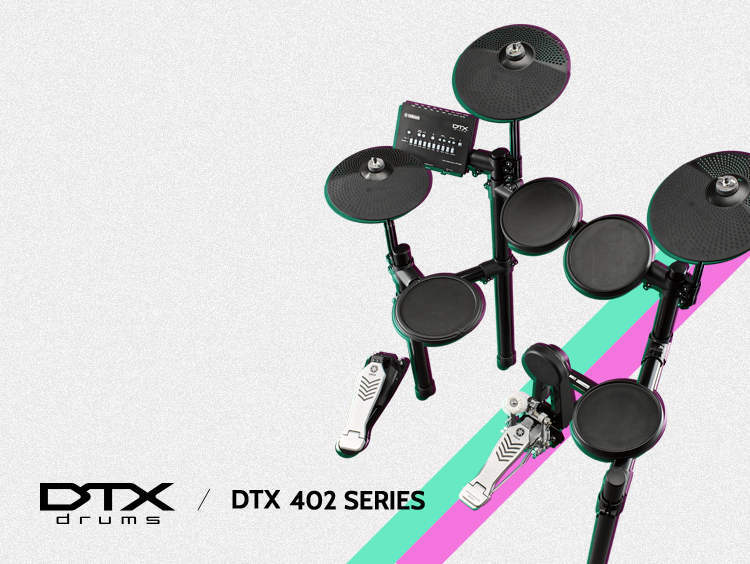 The DTX402 series is an update to the older DTX400 range, and includes some nice upgrades like quieter and more natural feeling drum and cymbal pads, and a redesigned rack for greater stability, pad placement, and customization. The brain driving everything is the new Yamaha DTX402 module, which includes 10 fully customizable drum kits and 287 drum and percussion sounds. The sound library covers all of the standard samples you’d expect, with a focus on pop, rock, and jazz drumming. There are also 128 keyboard sounds, 9 different reverb effects, training and learning functions, drumming exercises, and a recording function so drummers can listen back to their playing. The base model is the DTX402K, which features silent hi-hat and kick drum pedals, three cymbal pads, and four drum pads. The full-featured DTX452K comes with a three-zone snare pad (giving drummers a head, rim-shot, and cross-stick zone), a more expressive hi-hat pedal, and the KP65 kick drum tower with pedal. Along with the new hardware, Yamaha have also released the DTX402 Touch app for iOS and Android. The app allows drummers to fully customize their kits, control the module’s training functions, and access video tutorials and skill testing challenges. 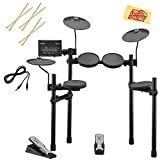 For drummers looking for a high-quality beginner’s electronic drum kit, these new Yamaha kits are great options. Along with Roland, Yamaha are one of the leaders in professional electronic drum gear. Click here to check the latest price of both models. For an alternative to Yamaha’s DTX402, read our review of Roland’s TD-1DMK electronic drum kit. This kit is in the same ballpark as the DTX402, however Roland include all mesh heads on the snare and toms! The main tradeoff is you can’t customize the drum kits on Roland’s TD-1DMK, but it’s definitely worth checking out as a quality option for beginners (or as a great quiet practice kit for advanced drummers). 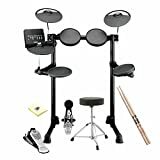 Looking to step up from the beginner’s range of electronic drum kits? Take a look at the new Roland TD-17 series, which is a great intermediate electronic kit. Need low-volume drumming options? Check out our guide to quiet drumming and reducing your drum kit’s volume – perfect for playing without annoying the neighbours.